neighborhood was allowed to watch the gothic daytime soap, so I sat alone in our downstairs den -- glued to my spot in front of the television equally transfixed and terrified. The show's vampires, witches, werewolves and lovelorn ghosts became my imaginary friends. I even convinced myself I was going to marry Quentin Collins, played by the show's most handsome actor, David Selby. I still remember the rainy summer afternoon I discovered the show for the first time. It had been on for several years by then. My younger brother and I, bored from being stuck in the house, were "changing the channels" looking for something to watch when I happened on what looked like a hypnotized man dressed in old fashion clothes walk through a graveyard. (It turned out to be Quentin) Even the music was scary. "We're watching this," I declared. I fed my obsession by reading everything I could about the show and its cast in 16 Magazine and Tiger Beat, collecting the picture cards, playing the Dark Shadows board game, buying the novels from my school's Scholastic book club and staging plays in our living room based on what I'd seen on the show. By the time I was in the fifth grade I'd decided what I wanted to be -- a writer of "scary stories" and "time travel." Fast forward several decades. I was writing for TV Guide and was assigned a 'Where Are They Now?" piece about the Dark Shadows cast and I interviewed Kathryn Leigh Scott, who'd appeared in the show's first broadcast on June 27, 1966 and stayed with the show a few months shy of its final episode. I couldn't believe I was actually having lunch with Maggie Evans! Kathryn, who has become the show's unofficial historian through the many books she's written and published about it through her own imprint, Pomegranate Press, was delighted by how much I remembered about Dark Shadows all those years later. Since then, we have stayed in touch and I've done several stories on Kathryn's many books -- including some terrific novels and her recent touching memoir about her late husband's illness. I've talked to her many times about ideas for my own novels but for some reason, have just not gotten around to finishing one of the several I've started. 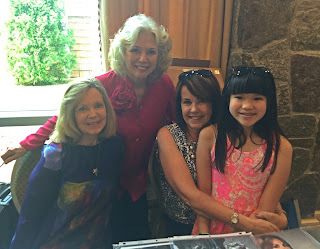 Last week, we got together again and she invited me to attend the annual Dark Shadows Festival which was celebrating the show's 50th anniversary. Many of the cast were going to be on hand to talk about the show, perform some original material and, of course, meet the fans. 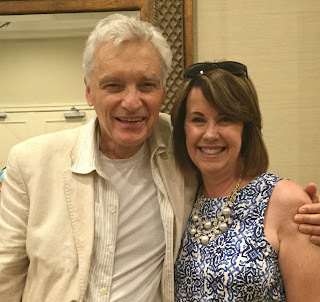 The actors scheduled to appear included many of the show's most popular performers including Kathryn, Lara Parker, John Karlen, Nancy Barrett, Christopher Pennock -- and David Selby. On the final day of the festival, with only a few hours left, I finally made it over to the hotel in Tarrytown where the event was being held. I was stunned by the presence of nearly 700 people who snaked through the lobby and down a long corridor in several lines waiting to meet the actors. Many were clutching the same books, photos and cards I'd collected as a child. It was something to see there were legions of people who felt as passionate about the show (arguably more so) than I had. I'd brought my daughter along more out of necessity than anything else, and on the way over I'd explained that we were going over to the hotel so she could meet my friend Kathryn who used to be on my all-time favorite show and hopefully we'd get to meet the actor "who Mommy had a crush on when I was your age." As we made our way through the crowd, Kathryn waved me over to the table where she was signing autographs and quickly came out from behind where she'd been standing to greet me and my daughter. "I've heard so much about you," she told Madeline who could have easily said the same thing to her. When there was a break in the action, she brought us over to Lara Parker, who played Angelique, my other favorite Dark Shadows female character. 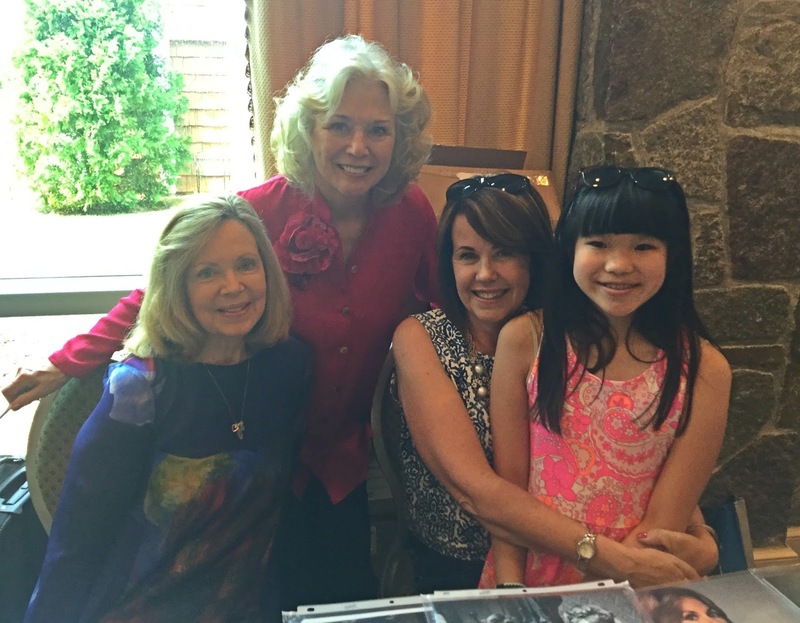 She was gracious and lovely and gave Madeline an autographed book. Someone working with them offered to take a photo and I can't stop looking the result photo (above). It occurred to me that I am now a mother to a child who was the same age I was when I first fell in love with Dark Shadows and its characters. It was the first time I really remember my very vivid imagination being sparked to create my own "scary" stories. To have my daughter there with me while I 'went back in time' to that place where I was a young girl so inspired reminded me of how passionate I was about following that dream. Then, when Kathryn brought us over to meet David Selby (pictured below), I was actually nervous. After having interviewed every actor and celebrity you could name over my decades long career as an entertainment reporter, I was almost speechless having come face to face with my childhood crush. "Mommy, is this the man you wanted to marry?" asked my daughter while we waited for him to finish talking to another fan. I had to laugh. When David stood up and offered his hand to me, it was truly a surreal moment. All of a sudden I was that lovestruck fifth graders all over again. I managed to tell him he was my first childhood crush and that I was sure I was going to marry Quentin Collins. He took hold of my hand with both of his and said, "I love that. Thank you for telling me that." After he took a picture with me, he asked if we could take one of him and Madeline. He was absolutely charming. The whole way home Madeline peppered me with questions about Dark Shadows and the actors asking me, "Were you really my age when you first watched it? Was it really scary? Was that man really handsome when he was young? What did he look like?" and finally, "Why do you still like the show when you haven't seen it in so long?" I told her Dark Shadows just touched something in me that made me want to be a writer. I'd forgotten that I had, in fact, entered a fiction contest at the end of sixth grade and won first prize for my story about a young woman who becomes a cougar in a zoo when she is cursed by a witch and she winds up killing the man she loves, the zookeeper. Very Dark Shadows-esque for an 11 year-old aspiring writer. I'd forgotten about how the show inspired me. Madeline said, "Mommy you seem so happy talking about all this." She was right. I'm grateful for the reminder as it comes at a time when I'm feeling at loose ends about what to do next in my career. Maybe the ghosts of Dark Shadows were meant to come back to haunt me and remind me that what I loved in the past just might be the key to my future -- even if I never got to marry Quentin Collins. Why not get the DVDs and show them to your daughter? Nice article. almost made me feel like I was there.